Author Joe R. Lansdale is currently co-producing a film with actor Bill Paxton based on his novel "The Bottoms." (CNN) -- Joe R. Lansdale has been a professional writer for almost 40 years. The East Texas author -- winner of too many awards to mention -- has written novels, short stories, graphic novels, screenplays, and has had his work adapted for big- and small-screen treatment. While working at his craft, Lansdale has kept his own literary voice. 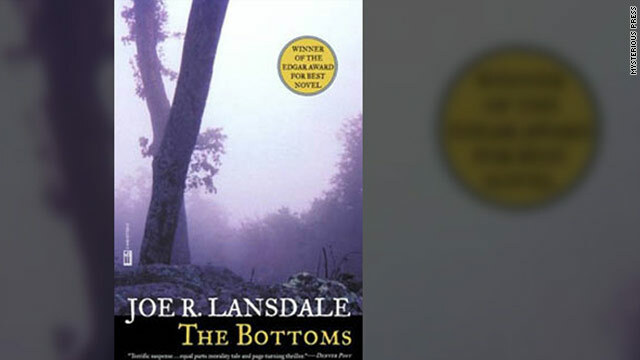 You know when you read his words that you are in Joe R. Lansdale country and it is a unique world unlike that of any other contemporary writer. He recently spoke with CNN about writing, martial arts, and how Hollywood has come calling. CNN: First of all who are you and what do you write? Joe R. Lansdale: I've been writing since 1973. I've written nonfiction things of that nature, but I'm probably best known for crime fiction and to some extent horror fiction. CNN: Did you always want to be a writer? Lansdale: Always. I never remember wanting to be anything else. I started writing when I was 9. My mother told me it was before that, but that was the first I remember. But I started when I was 9, started martial arts when I was 11 and next year I will have been doing martial arts for 50 years. CNN: What discipline of martial arts do you practice? Lansdale: My own style, shen chaun, and it was founded from all of my studies of other systems. So it's not that you invent martial arts, you invent your own approach to the martial arts that you learned. I loved the discipline of it. I think probably like a lot of people I liked the idea of not having bullies pick on you and stuff like that, but I think pretty soon it became more important to me because it gave me focus. It gave me the ability to roll with the punches not only with martial arts but in life, so it's very valuable. It is a philosophy as well as a defense mechanism. CNN: Your fiction crosses many genres from thriller to Western to horror to young adult. How does that affect your publishers? Lansdale: I think I made the right choice for me. I don't know if it would be the right choice for someone else, but what I did is I created my own genre. And so when people come to me most readers know that I do a variety of different things and so they like the unexpected. I know I do. CNN: What is your personal favorite of your work in short story or novel form? Lansdale: There's a very dark short story I wrote early in my career called "Night They Missed the Horror Show," and I'm very fond of that one because it was anti-racist, very satirical and it didn't explain itself. It left it for you to figure and it was a story that I think was important to me and taught me a lot of things, and certainly put my short stories on the map. With novels it depends what day. "The Bottoms" or "A Fine Dark Line" are two of my favorites. But I'm fond of the Hap and Leonard series too. CNN: Do you feel restricted in writing about series characters? Lansdale: There are eight novels in the [Hap and Leonard] series and one novella with a short story. I've never felt particularly held down by it. I think that if I were to choose only to write them, I would, but I also think it's why the stories feel fresh and fun, 'cause I write them 'cause I want to -- and when I want to. CNN: A bit of your work takes place during the Great Depression. Does this appeal to you? Lansdale: I come from blue collar. I'm very working class. I was a rose field picker, a janitor. I worked in construction. My dad was like 42 when I was born -- my mom 38 -- so they lived through the Great Depression. I grew up on those stories. My grandmother was born in the 1880's and lived till the 1980's, almost 100 years! She had seen Buffalo Bill's Wild West Show. She came to Texas in a covered wagon and saw historical things and Depression-era things in particular have always interested me. CNN: Any Hollywood interest in your work? Lansdale: Lots of it. I'm co-producing "The Bottoms" with Bill Paxton and "The Drive-In" with Greg Nicotero, who's a very fine special effects guy as well as director. I'm executive producer on a film based on a short story of mine called "Christmas with the Dead," and it's being filmed in Nacogdoches, Texas, where I live. The movie stars Damian Maffei and the script was written by my son Keith. And my daughter Kasey even has a small part. CNN: Your work does well in the European market. Any idea why Europeans embrace a Texas-based writer writing about the southwestern U.S.? Lansdale: Italy especially. I'm not exactly sure, but it's very funny when I've gone over there the last few years there are all kinds of papers on my work, and many people consider me the most influential writer in Italy for this generation. Now, whether that's true or not might be debated, but I'm just saying that it comes up constantly, and I do know that the works had an impact, and a directness about it and a humor about it that they feel is not as constant in Italian literature. Lansdale: In young adult I have "All the Earth Thrown to the Sky," which comes out this fall. It's a 1930s novel about the Great Depression about kids who want to leave Oklahoma during the Dust Bowl and try to make it to East Texas, which may not necessarily be all that much better, but at least it's green. I got some comics I'll probably be doing, plus screenplays. CNN: Since you have been doing this for a while, any days when the work feels like work? Lansdale: I always look forward to doing it. That doesn't mean there aren't days when it's hard. I generally get up, love what I do, go in and do it. I found that for me the trick is to try to only do three hours a day; three to five pages a day. And if I get more than that, that's wonderful. If I come back and want to work an extra hour later 'cause I just feel so inspired, that's wonderful.